Get My Report - GCW HOME INSPECTIONS, LLC. Please enter you email address to sign your inspection agreement. Are you selling your home? Let an InterNACHI Certified Professional Inspector® inspect it before you even list it. A Move-In Certified™ home has been pre-inspected, which means that the seller can confirm that there are no major systems in need of immediate repair or replacement, and no known safety hazards. 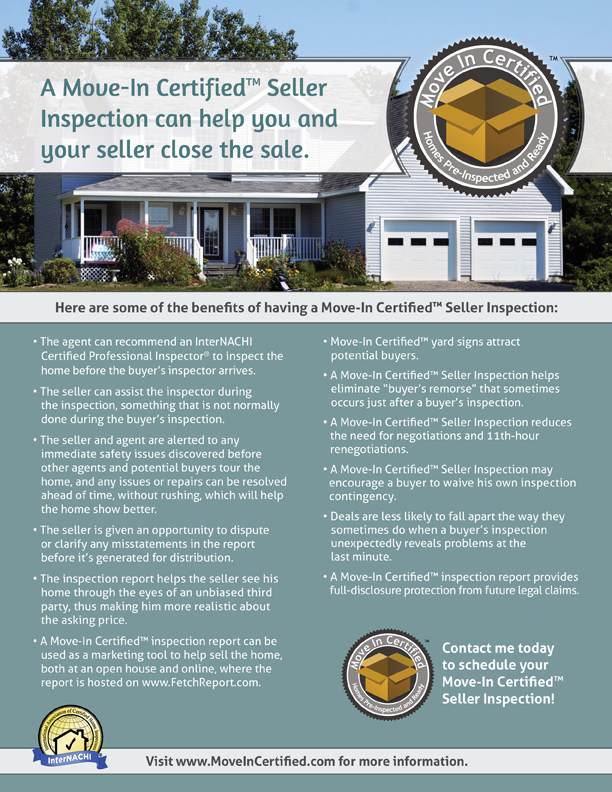 A Move-In Certified™ Seller Inspection informs you of any defects or problems with your home so that you can address them before prospective buyers discover them. You can then take the time you need to obtain reasonable repair estimates. Show prospective buyers that you are dealing in good faith. Avoid 11th-hour negotiations and delays, and justify your full asking price by having your home pre-inspected now. More info. Access Your Home Inspections Report by filling in your email address and the password .